An air duct system is to your home what the human respiratory system is to the body—expelling stale air and delivering fresh air necessary for normal functioning. However, ducts can sometimes contain particles and pollutants that are dangerous to your health, such as mold and asbestos. If you breathe them in, they can trigger allergies, respiratory problems or even more serious illnesses. This is why home duct cleaning should be performed if you have any reason to suspect poor air quality. It is a well-known fact that one of the greatest modern world health issues is indoor air quality (IAQ). The ugly truth is that pollutants are lurking in the air all around us, and for this reason, we need to ensure that, at the very least, our homes have the best quality air conditions. If you feel any discomfort due to poor IAQ, vent cleaning can offer some relief. 1Allergies: According to research, one in six Canadians experiences occasional allergic rhinitis with the highest number of people found in Ontario. Allergy season usually begins in spring and ends in fall, which is a long period to wait, hoping that allergens will disappear by themselves. Thanks to mold, dust mites and pets, sometimes your are more likely to get sick from the allergens inside your own home than the ones outside. 2Asthma: Not only can allergic reactions lead to sneezing and burning sensations in your eyes, but in certain situations they may worsen asthma, which might appear in 38% of people with allergic rhinitis. It is a well-known fact that dust and mold are one of the substances that can set off asthma attacks. 3Irritation: If you experience irritation in your eyes, nose, throat or skin, perhaps you need air ventilation cleaning. Itching and burning sensations are never a good sign, so checking your ducts by professionals could help detect the cause of your symptoms. Occasional inspections to confirm or deny presence of dust, bacteria, and fungi in the ductwork will not do you harm. 4Sinus issues: If pollutants are present in your duct system that means they’re also present in your home, and thus, the air you breathe. In addition to their persistence, infected sinus channels can lead to respiratory complications and long-term treatment. Why Is Air Duct Cleaning Necessary? There are no official recommendations when it comes to the frequency of duct cleaning, so the best way to be certain how often you should get your air ducts cleaned is to do a professional inspection. If you find one or more items from the list present in your home, there is a high chance you need more frequent home vent cleaning. Furthermore, chronic health conditions can be triggered by poor air quality–a major issue that many modern households struggle with. This is where cleaning your ventilation system helps by eliminating hazardous airborne particles from your HVAC system. The best way to do this is to hire a professional duct cleaning company. There are many things you could do by yourself when it comes to home maintenance, but proper vent cleaning should not be one of them. It can and should be done by fully trained and experienced professionals. So you’ve decided to move to another home… In addition to getting a thorough home inspection, it is also a good idea to check the indoor air quality as well as the condition of your new home’s ventilation system. If there are any concerns about IAQ, sort them out before you move in, and before you move in your possessions, in order to avoid complications down the road. Indoor air can contain 60% more toxins than the air outside of a living space. Luckily, you can do something to lower the amount of pollutants in your home. Schedule indoor air quality testing and have your ducts cleaned if required. Many things can enter air ducts, including mold spores, debris, dust, dead skin cells, insects and numerous other pollutants. Compromising your air quality should not be an option and regular ductwork maintenance is a must for a healthy and happy home. Duct systems are a complicated network of channels along which air passes. They need careful, responsible and professional care just like any other system in your home (electrical, plumbing, etc.). Please not, when we say “air duct cleaning,” we are not exclusively referring to ductwork, but a number of HVAC system parts. The first thing we do is establish the type of furnace your have and whether it also includes air conditioning. We then shut down the system in order to prevent any errors and then disconnect the blower unit carefully. When we are certain everything is ready, the vent cleaning process may begin. Mold Busters will carefully clean the cooling coils, blower unit, HEPA vacuum and coil cleaner. In order to make sure everything is done properly, we might cut some holes to place zone bags so that we can protect certain parts of the system. Similarly, we seal off all supply ducts in order to maximize vacuum air pressure. To make sure everything is done properly, we use high-efficiency tools for duct cleaning, such as specialized vacuums, blowers and brushes. We also apply the most effective techniques like negative pressure, vibration and brushing. Finally, we use an air compressor to clean the outside parts of the system, including the burners, furnace and blower. We will then proceed to replace the filters and in the end we will inspect whether everything has been done right. This is done in order to remove all dust and debris from the ductwork and to provide you with the best quality air conditions inside your home. Why choose Mold Busters in Ottawa & Montreal for air duct cleaning? Mold Busters will protect you in three simple steps: inspection, testing and remediation. We have extensive experience in IAQ maintenance, and we have helped our clients with a diversity of problems associated with poor air quality. Your duct enemies will receive a good punch from our cleaning professionals, and they will be less likely to come back in the long term. If you live anywhere in Ontario, Quebec or Nova Scotia, feel free to contact us and see what we can do for you. Why are we so sure in our air duct cleaning services? Since we began in 2005, we decided to provide the highest quality of services in anything we choose to do, and vent cleaning is just one of them. We do not compromise with your HVAC system–we clean it strictly following IICRC remediation guidelines. We are committed to ensuring better indoor air quality in Canada, and we try to provide the best service at reasonable prices. You are guaranteed to get professional inspections, recommendations and customer support. Our air ventilation cleaning will make sure your ductwork is cleared of dirt and debris that has piled up over time. To find out more about our air duct cleaning service, contact Mold Busters today. So, how exactly can air duct cleaning help you to restore and/or maintain your comfort when indoors? Household cleaners, mold, tobacco, pet dander, grease from food preparation and other tiny particles all come together in air ducts. Surprisingly, you can also often find fiberglass in air ducts too. Fiberglass is wrapped around air ducts and used as a thermal barrier or as insulation in walls. When ducts are damaged or deteriorating, particles of fiberglass can be introduced into the air you breathe. Inhaling these particles can damage your lungs and cause skin, eye and throat irritation in you and in your pets. Similarly, traces of water can be left in the ducts of your air conditioning system. This remainder of water has the potential to harvest mold and bacteria that might cause respiratory issues such as asthma, allergies or coughing. The bottom line: the cleaner your duct system, the better the quality of the air you breathe. Just consider that indoor air is recirculated on average 5 to 7 times each day through the duct system. Fresh air improves your body’s oxygenation, the functioning of your organs and your immune system, so ultimately, you are keeping yourself healthy by cleaning your air ducts regularly. All the particles mentioned above can create adverse reactions in even the healthiest of people. By cleaning your HVAC system regularly, you can reduce health risks associated with dust, mold, pollen and other air contaminants. If you have a friend or family member who suffers from breathing-related issues, cleaning the air ducts is essential to decrease symptoms and improve overall quality of life. Have you ever heard about Sick Building Syndrome? SBS is a medical condition linked to spending time in a building with poor environmental conditions. People start to exhibit symptoms such as headaches; eye, nose and throat irritation; fatigue; dizziness, and nausea while in the building without any apparent reason. Once they leave the building, symptoms tend to improve and even disappear. As far back as 1984, a World Health Organization Committee report suggested that up to 30% of new and remodeled buildings worldwide could be the subject of excessive complaints related to poor indoor air quality in the future. Since SBS is, by nature, difficult to diagnose, you may visit your doctor many times before receiving a proper diagnosis. The hassle and time required to make all these trips as well as the concentration problems associated with Sick Building Syndrome have undeniable consequences in your productivity. When the ducts of your heating, ventilating and air conditioning are clogged with dust and other debris, the system consumes more energy in order to work properly. Clean ducts will ensure optimal efficiency of your system. Based on estimates from the U.S. Environmental Protection Agency, homeowners could save upwards of 20% on their energy bill simply by having their air ducts cleaned regularly. 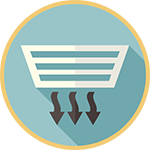 Not only you will save money, but you will also help the environment by consuming exactly the amount of energy that is needed to keep optimal indoor air quality. No more, no less. The concentration of dust and debris in ducts makes it harder for air to flow properly. As a result, the HVAC system will overwork, leading to decreased efficiency and increased costs, as more energy will be needed by the system to work. Besides, a dirty ventilation system can lead to clogged air conditioner coils, contaminated blower wheels, and other issues that might result in costly repairs. On average, up to 40 pounds of dust are created annually in a standard house, and some of it often remains inside the air ducts. Household cleaning products, mold, tobacco, pet fur, and other pollutants all accumulate in air ducts, creating a peculiar odour that travels through the furnace or air conditioner and ends up in the air you breathe. For a fresher smelling house, air duct cleaning is extremely effective. The removal of dirt that piles up in ducts reduces household dust and allows you to clean and maintain your home more easily. In addition, air duct cleaning often reveals other issues such as mouse or bat infestations, allowing you to remediate them before they become a serious problem or damage your home’s structure. Our everyday lives are surrounded by risks and are shaped by the decisions we make. Some risks are unavoidable, but others we can control. Your indoor air quality is precisely one of those things you can control with regular duct cleaning. By doing so, you are putting your health and the health of your loved ones first and creating the foundation for a long, healthy and happy life. We understand that you might have unique questions and requests when it comes to air duct cleaning, so give us a call if you want to ask or tell us something. 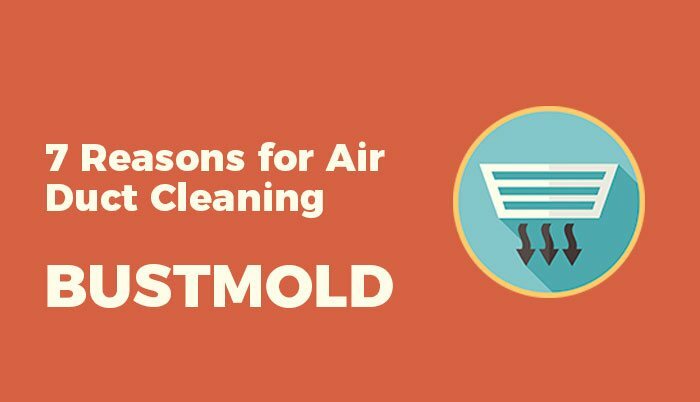 Also, we recommend you to read the following article (https://www.bustmold.com/blog/dos-donts-duct-cleaning/) in order to get more information about air ducts. It depends on a number of factors such as pets, place of residence, daily routines of people, whether there are smokers or not, has any construction work been done, etc. The best way to know if your ductwork needs cleaning is to schedule an inspection, and we will provide you with recommendations about ventilation cleaning, if necessary. I can do vent cleaning by myself, why should I hire someone to do it instead? You can try cleaning your air ducts. However, it is a complicated ventilation network which can be fully and properly cleaned only by professionals. By doing it alone, you risk not to remove the pollutants inside the ductwork. It is important to act according to the rules of air duct cleaning. Mold Busters uses IICRC guidelines and standards, which guarantee the job is done appropriately. How do I know my vents are cleaned well? Upon completion of all work, we provide a free comprehensive visual inspection of your air ducts to ensure the cleaning has been done thoroughly. How long does it take to have your air ducts cleaned? Typically, we finish the cleaning process in one day. It takes an average of 2 hours to do full cleaning, depending on duct conditions and the size your home.